There is good news and bad news from the circus of world leaders meeting in Paris for the next two weeks to try to save the planet and all of us on it from rising temperatures that will make life on earth unbearable. The good news is that there is increasing hot air about a global agreement to reduce carbon emissions to try to slow global warming. The bad news is that any deal will not be enough. It is not merely a question of too little, too late: there are substantial unresolved scientific, economic, political and moral issues at stake, which require a global solution, but the world is still divided into squabbling, often bitterly nationalistic countries, whose immediate or short-term interests are opposed to any global ideals. The meeting is starting on Monday in Paris . Finally, except in US Republican circles, which are trying to silence scientists from scaring people with hard facts, the message is getting through that the world can’t go on living if we chuck carbon dio­xide and other pollutants into the atmosphere. This year will be the hottest on record, according to the World Meteorological Organisation, and the world is on course to reach the significant milestone of 1 degree Celsius above the pre-industrial era. In spite of the gloom, some scientists optimistically believe that “Science Superman” will ride to the rescue in the nick of time. Rapid development of electric cars could transform transport by replacing polluting cars, lorries and buses with clean green energy. The cost of renewable energies, like solar power, is coming down, giving hope that in the foreseeable future, renewable non-polluting energy may replace the power plants that spew poison into the atmosphere. If transport and energy production go green, surely there is hope for humanity!? The world’s governments have finally woken up to the dangers and opportunities of climate change. More than 180 of the 196 parties which have gathered in Paris, representing 97.8 per cent of global greenhouse gas emissions, have submitted pledges to reduce their carbon emissions, known as the “intended nationally determined contributions”, or INDCs. “Green Planet” has become a buzz phrase. Big Western, Chinese and Japanese companies are salivating at the prospect of US$90 trillion in energy infrastructure business over the next 15 years. Optimists assert that if leaders in Paris signal they are serious about a green earth, business will deliver. Such is the momentum that Timmons Roberts of the Brookings Institution declared that “2015 has been an unexpectedly positive year for climate change efforts, as the long-floundering UN process has finally begun to deliver some of what is needed”. Roberts conceded that it’s not enough: “What do the INDCs add up to? Not enough reductions, unfortunately.” The world is still headed to 3.5 degrees Celsius, 3.1 degrees, or 2.7 degrees of warming above pre-industrial levels, “depending on the assumptions one uses in projections”, he said. INDCs are indicators, not binding. John Kerry, the US secretary of state, has ruled out any agreement signed and sealed, knowing that a formal deal would have to be passed in the US Senate, where the Republicans would kill it. Still to be resolved is who will pay for cuts in developing countries’ emissions. With 45,000 delegates, lobbyists, media and other hangers-on in Paris, any agreement will be a baby step forward. The US could and should be named and shamed for acting with no thought for the consequences of its selfishness, especially on poor and vulnerable countries. So should other major polluters. China recently revealed that it was burning 17 per cent more coal than previously disclosed. The increase in carbon dioxide involved is more than Germany’s annual emissions from fossil fuels. 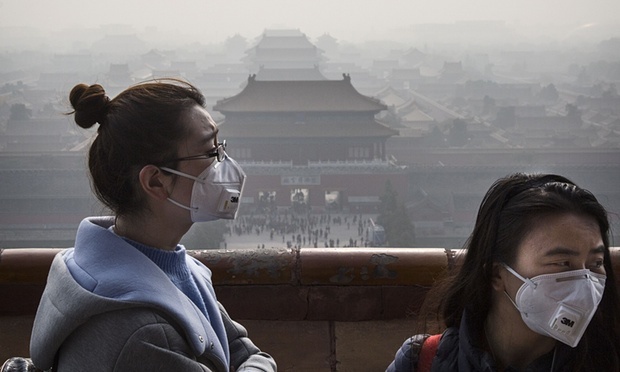 It was also unhealthily appropriate that, on the eve of the Paris talks, Beijing issued a warning of high smog levels. India, third in carbon dioxide emissions with 2.4 billion tonnes (behind China and the US), is on track to be at least the second biggest emitter by 2030 or even the biggest without dramatic measures. The Paris pledges are in terms of emissions per unit of gross domestic product growth, so a rapidly growing country could meet its pledges and still increase total emissions. India has been aggressive in what chief economic adviser Arvind Subramanian calls resistance to “the West’s carbon imperialism”. This accuses the West of hypocrisy in pumping mega tonnes of greenhouse gases into the atmosphere over the past 250 years to put the planet at risk, and then trying to handicap today’s rapidly developing countries because of their heavy reliance on coal. Chinese and Indians would be dicing with disaster for themselves and the planet if they ape wasteful Western ways, even if they don’t go the greedy hog into meat diets, with meat requiring far more resources to produce than vegetables. Let’s not forget a dishonourable mention for Japan, which pledged 1.3 trillion yen (HK$82 billion) a year to help developing countries fight global warming (and help its own companies to good business). Environment minister Tamayo Marukawa last week declared that coal technology exports “remain a priority” for Japan: surely she understands that clean coal is an oxymoron. Maverick economist Bjorn Lomborg suggests that all the huffing and puffing in Paris is indeed a lot of hot air. If all the INDC promises are fully met by 2030 and then extended for 70 years, he claims, “the entirety of the Paris promises will reduce global temperatures by just 0.17 degrees Celsius”. Lomborg advocates pouring money into renewable energy, though it is doubtful whether it will yield big enough benefits worldwide before it is too late. Many scientists have cast doubt on optimistic computer models suggesting that the temperature rise can be restricted to 2 degrees. Some claim that the only way to go is massive geoengineering, such as mirrors to deflect the sun or other large-scale interventions in the earth’s natural systems to counteract climate change. But such measures could be costly and might set off dangerous chain reactions. The problem is that greenhouses gases are already swirling in the atmosphere. Temperatures a couple of degrees higher may not seem much, and have led to warped jokes about Greenland as the world’s farming leader and permanent sun tans for the rest of humanity. Even a 2-degree temperature increase will trigger rising sea levels, engulfing Pacific island countries and invading Bangladesh and cities like Miami, New York, Guangzhou, Shanghai and Mumbai. Deserts will grow and millions of hectares of fertile farmland will disappear. One basic problem that Paris exemplifies is that we are one earth, and damage to a small corner of the planet comes to haunt us all, but leadership is narrow, national and selfish. Another is that the much revered market solution does not come with any guarantees about caring for our common home. The biggest problem for the broken leadership of the earth is that the time for action was the day before yesterday, but the way that leaders are talking, they might reach a workable agreement the day after the tomorrow that never comes. Those who live and work in Tuen Mun, Kwun Tong and Tung Chung spent more hours exposed to bad air in the first 11 months of the year than anywhere else in the city, according to a green group’s preliminary analysis. On average, the duration of bad air days recorded by the Air Quality Health Index was longer than what was recorded on the previous air pollution index, which was in effect between 2000 and 2013. Kwun Tong recorded the longest consecutive amount of time with “serious” air pollution – the highest level possible – at 48 hours. 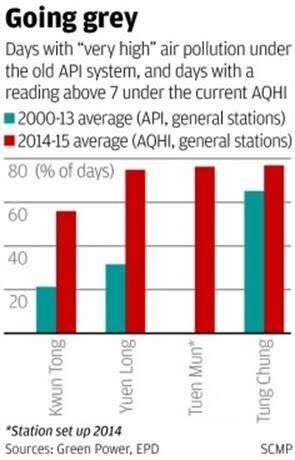 In terms of recording “high” readings or above, Tuen Mun and Tung Chung ranked first and third for the second consecutive year, based on monitoring stations in those districts. They clocked 395 and 334 hours respectively. Kwun Tong was second with 344 hours, ousting Yuen Long, which came second last year. The government says a reading of “high” on the new index means that children, elderly people and those with heart or respiratory illnesses should reduce physical exertion and outdoor activities, and they should stay indoors if a “serious” alert is in place. Cheng Luk-ki, head of scientific research at non-profit group Green Power, said ozone pollution – a hazardous secondary pollutant formed by volatile organic compounds reacting with nitrogen oxides – was most severe in western parts of the city. In a separate analysis of Environmental Protection Department data between 1999 and last year, the group identified a link between warmer weather and ozone formation. By plotting daily maximum ozone concentrations against maximum daily air temperatures, Cheng calculated that a one-degree rise in temperature would lead to an increase in ozone by 17.4 micrograms per cubic metre in Tung Chung and 13.2mcg in Yuen Long district. Additional emission sources in the region – such as the planned third runway at the airport, the Hong Kong-Zhuhai Macau bridge, new boundary-crossing facilities and waste incinerators – would add to ozone pollution, he said. Based on figures cited in a 1998 departmental report, the group said health care costs would soar by at least HK$988 million per year for the rest of the century – just from ozone. An EPD spokesman said days with high pollution at the ambient air stations cited usually coincided with high ozone in the entire Pearl River Delta region, weak north or northwesterly winds and lots of sunshine. He also said because ozone was a secondary pollutant, it did not have to be included in environmental impact assessments. The department said it would continue to cooperate with Guangdong to reduce pollution. The Civic Party is urging the Airport Authority to delay construction of the third runway because of a labor shortage and insufficient raw materials that have beset major projects such as the Hong Kong-Zhuhai-Macau Bridge. Legislator Kwok Ka-ki said the construction of the third runway might go over the budget as has the bridge project and the Liantang Boundary Control Point, which have cited both reasons for the delay. The authority estimates that the runway will cost HK$141.5 billion. Since the authority is not expected to sign the deal with contractors until next year, he said, there is time for government officials to reconsider the schedule and to suspend it for now. Kwok also said there are many other problems that have not been resolved including the so-called “sky wall” a requirement by the People’s Liberation Army Air Force for aircraft departing from Hong Kong to be at an altitude of more than 15,700 feet before entering mainland airspace. “Why did the government give the green light to building the third runway when it knows the cost has been increasing?” Kwok said. Hung Wing-tat, an associate professor in the department of civil and environmental engineering at the Hong Kong Polytechnic University, said that in 2009 the government estimated there would be 40,000 vehicles using the Hong Kong-Zhuhai-Macau Bridge, but the number is likely to be less due to economic slowdown. Last week, the Highways Department revealed that completion of the bridge has been put back a year until the end of 2017. Hung also said the government should have estimated the possible labor shortage and a lack of materials during the project planning stages and it should not now be used as the main excuse for a delay in the construction. He also criticized officials for a delay in implementing the boundary crossing agreement. Kwok said he will question the Three- Runway System Advisory Committee in the Legislative Council tomorrow. In a statement on Saturday, Secretary for Transport and Housing Anthony Cheung Bing- leung said the Joint Works Committee of the Three Governments will be making a final call on completing the bridge and its opening. A scene from Beijing shrouded in heavy smog. BEIJING: China, the world’s top emitter of greenhouse gases, has achieved the pollution reduction targets for major pollutants six months ahead of schedule, Chinese government has claimed as President Xi Jinping today left for Paris to attend the UN conference on climate change. Xi will attend the inaugural session of the Paris meet stated to be the most crucial in clinching a global climate deal amid strong differences between the developed and developing countries. China is the top polluter after the US in greenhouse gases. China and the US reached an agreement last year to take ambitious action to limit greenhouse gases. As Xi left for Paris, Environment Minister Chen Jinping said that China has attained the pollution reduction targets for major pollutants outlined in its 12th Five-Year Plan, six months ahead of schedule. He, however, said a substantial improvement of the environment will only be possible if pollution is reduced by a further 30 to 50 per cent, he said. His claims came as Beijing and many parts of China continued to be engulfed with hazardous smog far exceeding safe levels prompting Chinese environment authority to send special teams in Beijing and to neighbouring cities to covertly search for illegal emissions. Recent reports also said China is under reporting coal usage to claim drastic cutdown of its usage. In the 12th Five-Year Plan (2010-2015), China vowed to cut sulfur dioxide emissions by 8 per cent and ammonia nitrogen and nitrogen oxide emissions by 10 per cent compared with 2010 levels. Chen said that the surface area affected by acid rain in China had shrunk to 1990s levels, while water quality had also improved significantly. China has phased out some 250,000 tonnes of ozone- depleting substances during the same period, he said. This is more than half of the total amount phased out by all developing countries. “Not only are we working to fix our domestic environmental problems, we have made considerable contributions to addressing international challenges, too,” state-run Xinhua quoted Chen as saying. The minister warned, however, some 20 million tonnes of major pollutants are still discharged annually in China, and that figure must be reduced by another 30 to 50 per cent. One year after the world’s second-largest economy “declared war” on pollution, following decades of pursuing growth at the expense of the environment, Chinese citizens are still concerned by air quality, particularly in the big, industrial cities in the central and eastern regions. The warning comes as the governments of more than 190 nations gather in Paris to discuss a possible new global agreement on climate change. China, the biggest emitter of greenhouse gases in the world, is suffering from serious air pollution, largely attributed to smog from coal-fired power plants. The onset of winter and the need for more heating of homes means the problem has intensified in the capital, which has an estimated population of 20 million. At noon on Saturday, the US embassy in Beijing reported the level of the poisonous, tiny articles of PM2.5 at 391 micrograms per cubic metre. The World Health Organisation considers the safe level to be 25 micrograms per cubic metre of the particulates. 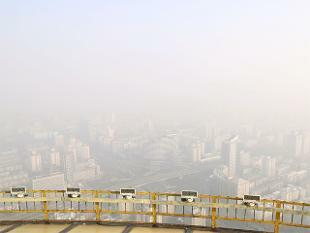 Residents of Beijing posted photographs of the pollution on Twitter. In the past, authorities have shut down factories and pulled half of the vehicles off the roads to curb pollution. But such drastic measures are disruptive and only used when Beijing feels it needs to present a better image to the world, such as hosting major global leaders and events. Earlier this month, air pollution reached almost 50 times above the recommended levels in Shenyang, in the country’s north-east. On 9 November, levels of PM2.5 reached 1,157 micrograms per cubic metre in the city, reducing visibility to as little as 100 metres. Officials said the dangerous smog was caused by a surge in coal-fired electricity use, as the region’s central heating systems kick into gear for winter. The cost of land formation and marine works in the airport’s third runway project is estimated to soar over 52 per cent to HK$56.2 billion, according to a paper submitted yesterday to the Legislative Council. The Airport Authority itemised a breakdown of its total estimated construction cost for the project in a paper submitted to Legco on Thursday. The ‘money-of-the-day’ estimates were based on the government’s price adjustment factors set out in March this year. The authority said reclamation works would require meticulous care to form 650 hectares of land north of the existing airport island. It said this was because about 40 per cent of the reclaimed area was underlain by disused contaminated mud pits within a layer of marine mud. It said the contaminated mud was highly disturbed and was softer than its surrounding mud. A combination of precise techniques and procedures would be adopted to strengthen the soft marine mud to be left in place. However, at the same time, the eventual land would have to be strong enough to be stable, the authority said in the document. It also revealed that the cost of expanding the airport’s existing terminal two as part of the third runway project would increase to HK$16.5 billion, up from the previous estimate of HK$9.5 billion projected in 2010. The authority said terminal two, at present only handling departures, would be expanded to serve departure, arrival and transfer operations to provide full-fledged terminal services. The expansion would involve modifying the terminal two building and adding two annex buildings, each to the north and south side of the terminal, to house coach staging areas, arrival pick-up, loading and unloading bays as well as car parking space. COP21: Why do two degrees matter? A combination of a strong El Nino and human-induced global warming made the five-year period from 2011 to 2015 the warmest on record, researchers say. The new findings are likely to feature prominently at the UN Climate Change Convention in Paris, when global political leaders and negotiators will aim to secure a new global deal that would limit emissions of carbon dioxide. Climate negotiators agreed in Cancun in 2010 to commit their governments to “hold the increase in global average temperatures below 2C above pre-industrial levels”. BBC environment correspondent Matt McGrath assesses the significance of that figure, and why it is seen as the gateway to dangerous warming – all in less than the time it takes to make a coffee.